Benin’s population has more than tripled since the 1950s (UN, 2015). In Central Benin this steep population growth has been caused by both high birth rates and an influx of migrants who have been drawn to the area ever since the French colonial regime introduced labor-intensive cash crops, such as tobacco, cotton, and groundnut. The migrants have contributed to the economic development of the area by providing a steady supply of labor, but at the same time their presence has added to the pressure on the savanna ecosystem. Deforestation from clearing the natural woodlands for farming has been common throughout this region. 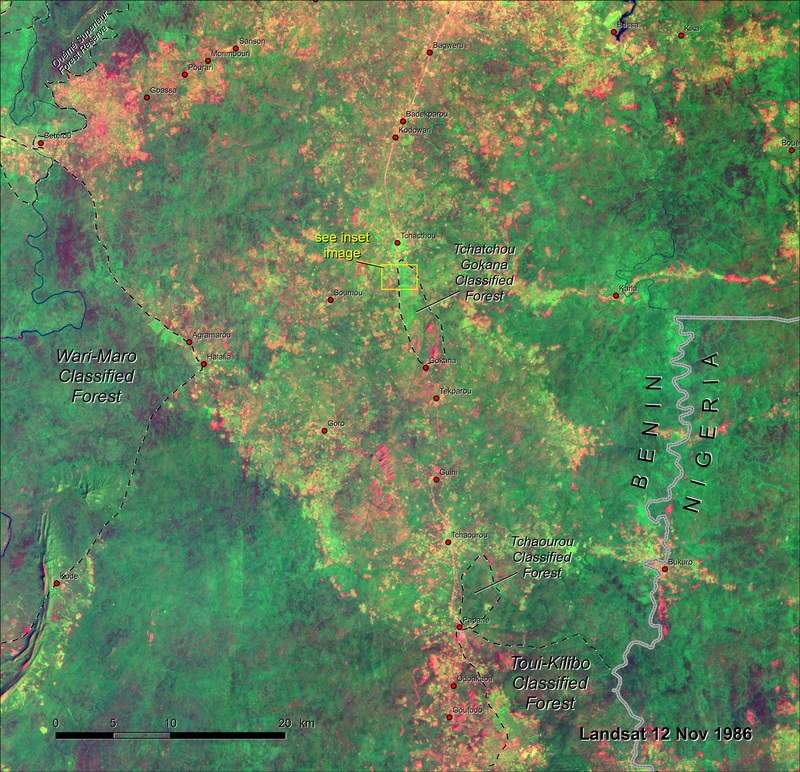 A comparison of Landsat imagery from 1986 and 2015 shows a dramatic decrease in natural savanna and woodlands (darker greens) surrounding Tchaourou. Even inside the protected forests of Tchatchou, Tchaourou and Toui-Kilibo, which had already experienced some minor clearing, the area of wooded savanna has been decimated. The land cover maps measure a decline in savanna from 72 percent of the study area in the 1970s to less than 45 percent by 2015. During the same period agriculture has grown by four times to cover over 44 percent of the study area. Agricultural landscapes, including rainfed cropland and plantations, now dominate. Within the agriculture areas however, the expansion of cashew plantations has helped to mitigate the loss of woody cover and biomass, somewhat offsetting the loss of trees from deforestation. The right half of the 2003 inset image (top of past image) shows some remaining forest cover within the Tchatchou Gokana Forest Reserve. 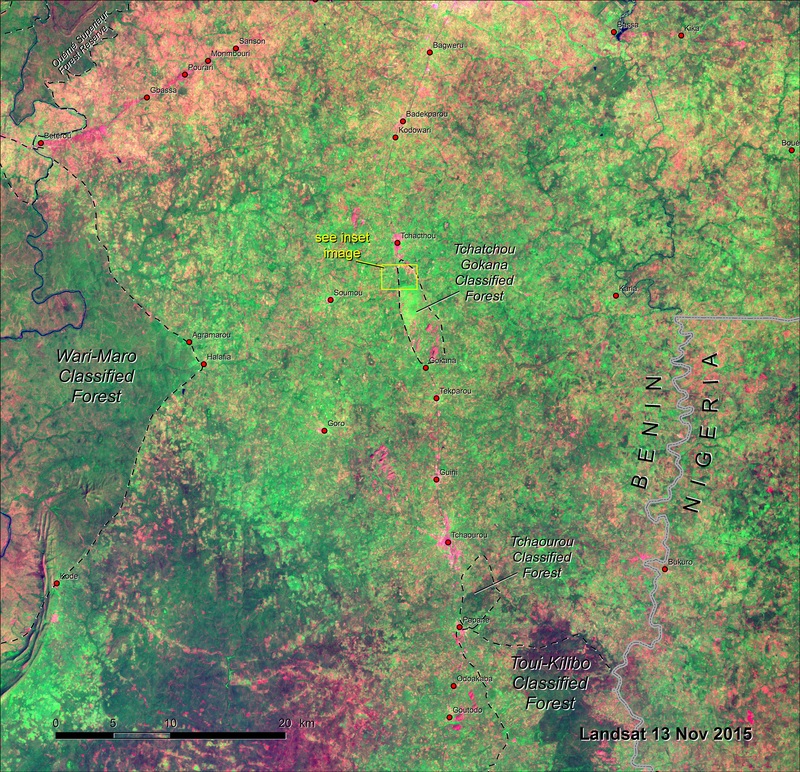 In contrast, by the time of the 2012 inset image (top of recent image) there are more cashew trees outside the reserve than natural tree cover within it. The proportion of cashew plantations has risen greatly as a percent of the land area in 2013. Like other afforestation activities, cashew plantations protect against soil erosion, contribute to increasing soil fertility, and create a cooler microclimate. Several factors have contributed to the success of the cashew economy. Many small producers received monetary support to invest in cashew cultivation as part of the national development strategy of promoting export-oriented economic sectors. The large and growing rural population provides a continuous supply of labor. Cashew nuts are in high demand on the global market, and Benin’s market shares have increased to make it the 5th largest producer worldwide (US Department of State, 2015). The cashew tree is well adapted to the environment in Central Benin. It requires very little input and can thrive even on poor soils. Hence, it is very well suited for the rehabilitation of degraded lands.